In this two part series, we will consider the various options available to you when it comes to leveraging your investments and how using this strategy correctly can support you to build your long-term wealth. Leveraging (also referred to as gearing) involves borrowing money to invest with the aim of increasing the potential return on your investments. In simple terms, leveraging is about using a smaller amount of your own money to gain a larger exposure to an asset using other people's money. The benefit of using other people’s money or borrowing to invest is that it increases not only your gains but your ability to build an investment portfolio over a shorter time frame. It also allows you to take advantage of investment opportunities when you may not otherwise have the available funds to do so. Many often regard this strategy as high-risk investing because if the investment goes badly you can potentially lose a lot more than your original capital. However, if done correctly, it can provide an enormous financial boost to your wealth-creation strategy, enabling you to become financially independent much earlier than you might otherwise expect. Unfortunately, we have been conditioned to believe that borrowing for personal consumption is acceptable to sustain our preferred lifestyle but not acceptable if the funds are used to increase returns from investing. But it is this mindset that keeps many from achieving their financial goals. The reality is that only a small percentage of the population actually achieve financial independence because they focus most of their attention on deriving an income from their job to purchase assets that fall in value, rather than acquiring the knowledge to accumulate investments that produce an income. In other words, they work hard for their money instead of allowing their money to work hard for them. But if you want to retire on a sustainable income that will maintain your standard of living, you need to consider using leverage to trade shares as part of your overall investment strategy. While there is still a great deal of controversy surrounding this concept, we hope to dispel these arguments and demonstrate how you can leverage your way to financial success. It is the dream of many Australians to own their own home; however, in most cases this is only achievable by borrowing other people’s money, which for the majority of Australians is their first exposure to leveraging. 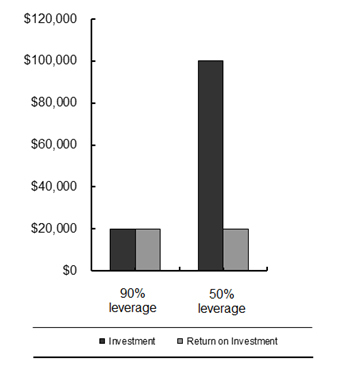 How much you borrow will affect the return you receive from the capital growth of the investment. Let’s imagine you and your best friend each decide to purchase a home worth $200,000. You decide you will invest $100,000 of your own money and borrow $100,000. Meanwhile your friend only invests $20,000 of her own money and borrows $180,000. Who do you think will get the greatest return on their investment if each property rises by 10 percent? If you said your best friend, you would be right. 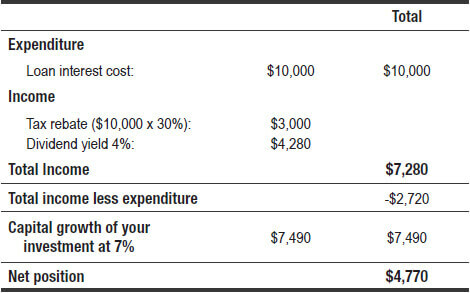 As shown in Figure 1, below, if your property rises by 10 percent you will make $20,000 on your $100,000 investment or 20 percent. But if your best friend’s property rises by 10 percent, she will make a 100 percent return on her investment because she made $20,000 on her initial $20,000 investment. If you are like most people, you probably believe your home is an asset. However, an asset is something that puts money in your pocket, while a liability takes it out. If we think of our assets and liabilities in this context, then your home is a liability because it is costing you money, although it is a positive liability because it will appreciate in value. It is possible, however, to leverage this liability to create income-producing assets. Let’s assume your property from the above example continues to rise in value and after five years it is worth $280,000. Since you have continued to make repayments on your home loan, you have reduced the debt owing to $155,000. The difference in the capital growth of your home and the debt you owe is referred to as equity or the accumulated wealth from holding the asset. You can now take advantage of the true benefits of leveraging by using the equity in your home to invest in other assets that actually produce both capital growth and income. The benefit of using other people’s money is that it increases your ability to invest in shares and build a powerful portfolio. It also allows you to take advantage of investment opportunities when you may not otherwise have the available funds to do so. More importantly, leveraging increases the income and capital gains you receive from your investments and it has the potential to reduce your tax liabilities. But just as leveraging can increase your gains, it can also magnify your losses. Therefore, you need to consider the risks of borrowing to determine if this form of investing is suitable for you. Remember, everyone’s tolerance to risk is different. That said, in my experience the benefits of leveraging far outweigh the risks when you understand the concept and invest in a well diversified portfolio of blue chip shares that rise in value. Borrowing against your property to invest is like using cash, as you draw the equity in your loan to put into another investment. And like with all loans, you will be required to pay interest on the drawings but this is tax deductible against the income you generate. Depending on the level of equity you hold in the property, your bank may allow you to use that as security to take out a line of credit, which is typically up to 80 percent of the value of the available equity in the property. Now let’s imagine you now own a home worth $400,000 and you have $200,000 outstanding on a mortgage. Therefore, you have $120,000 in equity (up to 80 percent of the available equity) you could use to leverage other investment opportunities. So, you decide to borrow $100,000 in an interest-only loan to place in a portfolio of blue chip shares. Assuming you are charged interest of 10 percent per annum to borrow the money, you will be required to pay the bank $10,000 each year. Remember, however, that the interest payable on the borrowed funds is tax deductible because you are using the funds for income generating purposes. For the purposes of this example, we will assume you are in the 30 percent tax bracket. You decide to invest the $100,000 in solid blue chip stocks that pay an average dividend yield of 4 per cent (fully franked) and your portfolio grows an average of 7 per cent per annum. So what is your net taxable position at the end of the first year? As you can see in Figure 2, below, even though I used an interest rate as high as 10 per cent and a tax rate as low as 30 percent, you are still $4,000 better off at the end of the first year using leverage to increase your net wealth. In terms of return, you actually spent $3,000 to receive a capital gain of $7,000 or a 233 percent return on your investment. Now that’s what I call positive debt. What’s even more exciting is that your returns get better every year by simply utilising the law of compounding. Let’s take a look at the second year of this investment strategy to see where you would stand. We will assume that the rates of return remain the same but now you are compounding your return on $107,000 invested in blue chip shares. As you can see in Figure 3, below, your net taxable position has increased yet again. If we continue compounding our returns, in the third year we would reinvest $114,490 and receive $8014.30 in capital growth and $4,579.60 in dividend income. Even when receiving very average returns like 7 per cent, the example demonstrates how powerful the technique of leveraging can be. For as long as you maintain the portfolio, the return will increase, assuming you continue to invest in assets that rise in value. Now you are probably saying ‘what about the $100,000 I still owe the bank, when do I pay that out?’ The point is, the longer you hold onto the portfolio the greater the compounding effect. Eventually, you will reach a point where your investment will pay out your total home loan, if that is your goal. Depending on your tax position and how you have structured your loan repayments, you can achieve this in less than 10 years. And when you combine this knowledge, with the laws of wealth creation, you will be well on your way to achieving financial independence. In Part 2 of this series on using leverage to trade shares, we will look at how you can use a margin loan to invest in the share market if you don’t have a house to use, as collateral as well as understanding the Rule of 72, which enables you to compound the success of your investments. You may also want to consider purchasing my latest book Accelerate Your Wealth, It's Your Money, Your Choice, which provides you with a proven, low risk approach to investing directly in the stock market. We also offer accredited trading courses in share trading that will enable you to achieve your goals in the stock market. You can also check our what our clients have to say about their trading journey by viewing their reviews and testimonials.